In this post, you'll learn 22 scarlet macaw facts. They include appearance, habits, threats, and more. Plus lots of photos and videos. 1. What does a scarlet macaw look like? 2. How big is a scarlet macaw? 3. What is the scarlet macaw's wingspan? 4. How much does a scarlet macaw weigh? 5. Why is a scarlet macaw so colorful? 6. Do scarlet macaws talk? 7. Are scarlet macaws friendly? Or aggressive? 8. Do scarlet macaws make good pets? 9. How long do scarlet macaws live? 11. How does the scarlet macaw protect itself? 12. What do scarlet macaws typically eat? 13. Are scarlet macaws endangered? 14. What is the scarlet macaw’s Latin name? 15. Is a scarlet macaw actually a parrot? 16. Where does the scarlet macaw live? 17. Do scarlet macaws live in groups? 18. Do scarlet macaws mate for life? 19. How often do scarlet macaws lay eggs? 20. Do scarlet macaws carry disease? 21. What is the national bird of Honduras? 22. Where can I see the scarlet macaw? Macaws are beautiful! These vibrantly colored birds are as intelligent as they are stunning. Which, of course, makes them an avian of interest. What is it that draws us to these creatures? Where do they live? What kind of food do they enjoy? Those are a few of the questions we’re going to answer. The name scarlet macaw seems pretty descriptive, but what does it actually look like? Well, according to the Rainforest Alliance, a scarlet macaw is fantastically brilliant! A white, barely feathered area encircles bright eyes, leading into the ravishing red feathers covering most of this gorgeous bird’s body. The wingtips and tail feathers are a deep blue and sunny yellow, giving this bird a reason to preen that has nothing to do with pea-cocking. Macaws are among the largest in the parrot grouping. Scarlet macaws are one of the largest in length/height for its species. Measuring in at nearly 3 feet, 81 centimeters or 32 inches, almost half of that length is made up by the scarlet macaw’s tapered tail. 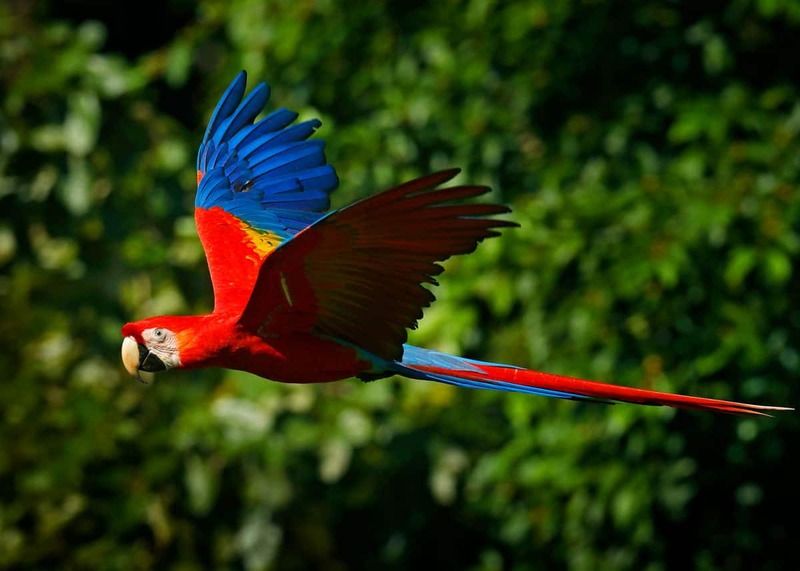 The Scarlet Macaw’s wingspan is right at about 1 meter or roughly 3 feet. An average adult scarlet macaw will weigh up to about 1 kilogram, or 2.2 pounds. There’s no doubt that the scarlet macaw is colorful. While the scarlet macaw’s plumage might make it stand out in a Kansas field, in its home territory it blends perfectly in. It is indigenous to the South American rainforest, with vivid flowers and brightly colored fruits and berries. The scarlet macaw, if left in their natural habitat, would be perfectly camouflaged against most predators. Like all macaws, the scarlet macaw will mimic human speech. They are highly social animals and can be taught words or phrases easily. They mimic their environment and the humans they are closest to, and just like children, will “parrot” most phrases you wouldn’t necessarily want them to. So be careful what you say around your scarlet macaw, or your face could be just as red as their plumage. Scarlet macaws bred in captivity are quite affectionate. Hand-feeding helps to earn your macaw’s affection and trust, but keep in mind, these are loud, raucous, and social birds. They have the ability to become aggressive – especially if they aren't given enough stimulus. In the wild, scarlet macaws are neither friendly or aggressive but simply keep to themselves. You have little to fear from a scarlet macaw. They’re intelligent, but not made to be alone. If you have a job or responsibilities that keep you out of your home, your scarlet macaw will need a friend to keep it company. If they become lonely, they’ll develop nervous habits like biting or tearing out their own feathers. Because of their loud nature and large stature, they’re also not recommended for apartment living. These birds need room and lots of it! To be a good macaw pet parent, it’s essential to research the bird before deciding to adopt one. It is also important to note that captive-bred macaws are typically hybrids. Deforestation is eating into the scarlet macaw bird population, and like many macaws, they’re close to being on the endangered species list. Because all macaws can interbreed, it is highly suggested to bird-breeders to mix their macaws so that they aren’t liable for trading in exotic but endangered birds. If you’re considering becoming a pet parent to a scarlet macaw, keep in mind that these gorgeous creatures can live up to 75 years. Their average life-span is closer to 50-60 years. These are lifelong companions, and barring any sudden illnesses or injury, will likely live just as long as you do. If not longer. It’s important that these birds are well-taken care of, so if you are planning to add them to your family, you will need to make provisions for them. According to animaldiversity.org scarlet macaws, by sheer size, thwart most predators. They are at their most vulnerable in the nest. Hatchlings can be hunted by snakes, monkeys, and a few other small predators. Adult or fledgling scarlet macaws are hunted by larger jungle cats or larger birds like the eagle. The main predator of a scarlet macaw is actually humans. The rise of deforestation has seen a devastating decline in macaw numbers. Likewise, because these birds are so beautiful, they’re in danger of poaching and smuggling. Poachers will kill the adult parents for their gorgeous plumage and then smuggle the chicks into a legitimized market for these lovely animals. They have wings and they know how to use them! 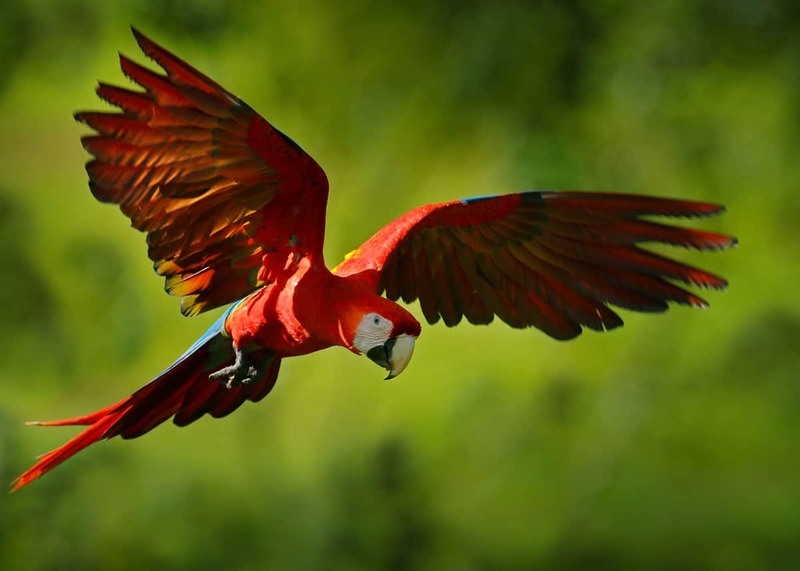 The scarlet macaw’s first line of defense is to simply fly away. If for some reason that isn’t an option, the macaw is equipped with a curved beak and wicked talons. The bird will bite or scratch the predator, and use those enormous wings to bat the offender into submission. Another way the macaw might protect itself is turning tail. With its tail feathers making up half its body length, a predator would only get a mouthful of feathers on the first bite, letting the macaw get away relatively safely and mostly unharmed. Thanks to their strong, curved beaks, scarlet macaws are quite happy munching on nuts as well as the prevalent fruits and berries that grow in their natural habitat. Because they are avid fruit-eaters, they are also considered ‘seed bearers' as a species. They can be a highly effective tool for reseeding deforested areas with the local fruit trees, as their droppings will contain seeds from the fruit they consume. According to fws.gov, there is talk of adding the scarlet macaw to the endangered species list. As of right now, they are not considered endangered, but their population is in decline. There are plenty of factors that can determine a species place on the endangered list, and for the scarlet macaw the most prominent is deforestation. The rapid rate at which the Amazon Rainforest is disappearing affects these territorial birds’ habitat. One of the best known Scarlet Macaw facts is it’s scientific (or Latin) name. The scarlet macaw is known in the scientific community as the Ara Macao. Ara is probably a derivative of the Portuguese word arara, which means tricolor. This bird is fairly famous for its bright and multi-colored plumage. Indeed! The Scarlet Macaw is actually a member of an exclusive group of Neotropical parrots known as macaws. Macaws are Neotropical parrots, so it’s no wonder one of the scarlet macaw facts is well-known. Scarlet macaws are found in thick, dense rainforests mainly located in southern Mexico, Peru, Brazil, and Trinidad. They make their nests in the humid climates of these ranging forests, near rivers where the vegetation is thick, lush, and bright. 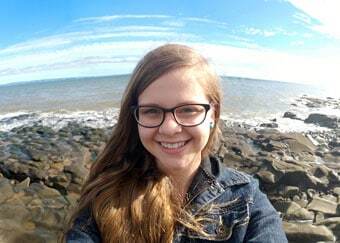 Here, they’re camouflaged from predators. Amazon Rainforest: The scarlet macaw calls the Amazon Rainforest home. The rainforest stretches across Brazil, through South America, and the Amazon River is a perfect water source for these bright birds. There are some successful programs to reestablish the population in Mexico and Central America. They are typically found in mated pairs or small family groups, but can occasionally be found to roost in flocks up to 50 unrelated birds. Yes! For better or worse, once a mate is selected by a scarlet macaw, they’re life mates. They maintain large territories with perfect places to nest among the vegetation. These territories are largely for the nuts and fruit the macaws eat. A mated pair of scarlet macaws will lay anywhere from 1-4 small white eggs a year. They are highly protective of their eggs and hatchlings. The female will protect the nest for the 28 day hatching process. Both parents care for the hatchlings after breaking the shell. Once the chicks fledge after 14 days, they are left mainly to their own devices, the best way to learn is by doing, after all. Juvenile scarlet macaws may remain with their family unit up to 2 years after hatching. Watch this baby scarlet macaw grow up over a span of 65 days! Typically, no. Macaws have fairly stout immune systems. However, there is one disease that most macaws carry, and that’s Psittacosis, also known as ‘parrot fever’. It is contagious, easily transmittable from a sick bird to a human. This is caused by inhaling dander in the macaw’s feathers or dust from droppings. It comes on similarly to the flu, with body aches, dry coughing, and fever. It is easily treatable with antibiotics. Limit your handling of sick birds. Keep your sick macaw isolated from its parrot friends. Clean cages and coops regularly. Use a mask when cleaning cages to avoid inhaling dust from feathers or droppings. Treat your sick macaw with antibiotics for at least a month. As always, thoroughly wash your hands after handling your macaw or cleaning its cage. The scarlet macaw is Honduras national bird. It was decreed on June 28, 1993, by Hondura's National Congress. This despite scarlet macaws being threatened in the country. A center in Mabita, Las Mosquitia is one of the few areas with a population of scarlet macaws. Unless you’re planning a trip to southern Mexico or South America to see these beautiful birds in their natural habitat, the next best place to see them would be in a local zoo. Most zoos boast a large parrot population, and the flashy scarlet macaw brings visitors by the droves. The best zoos for viewing the scarlet macaw are located in the Americas. Saint Louis, Indianapolis, and the San Diego Zoo are all known for their flocks of macaws, especially the scarlet macaw. The habitats made up for these avian wonders are near-identical to their natural habitats. As they are sociable, it’s not unusual to be “bird-watched” right back by these naturally curious creatures. Scarlet macaws are some of the most spectacular avian species in the world. Intelligent, social, and brightly colored, these birds stand out among their genus. If properly cared for, they become a highly entertaining and valued member of your family unit. Your next zoo visit should include a stride through the aviary to catch a glimpse of these majestic birds. They are also prey to some of the darker parts of humanity and need to be protected all the more for it. Have a question about scarlet macaws? Or maybe a fact to share? Join us in the comments!